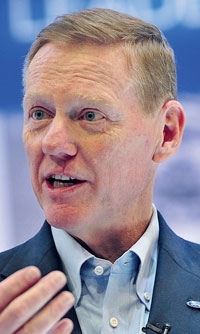 Ford CEO Alan Mulally says the company is in "good shape" in Europe where its pretax losses increased to $306 million in the third quarter from $197 million in 2010 and isn't planning to reduce capacity in the region. Mulally spoke with Publisher Peter Brown, Editor Jason Stein and Industry Editor James B. Treece on Nov. 2. Q: What do you see for the American and global economy in the next 15 months? In the United States, we see a continuing expansion of the GDP -- maybe 1.5 to 2 percent this year and maybe 2 percent or a little bit more next year. It's a slower recovery than we've had in the past, but it's also recovering from the deepest hole. This is a very positive thing. I'm very encouraged, too, by the leadership of the country [being] focused on economic development. Europe clearly has a lot of uncertainty. Again, the good thing is that the leadership is really trying to address it. That's going to take awhile, so we see zero to slightly improving economy in Europe next year. Yes, but it's going to be very mixed among the countries. If you're looking at slower growth in Europe, do you think you might have to scale back production plans there? No, we're in pretty good shape right now. We've just got to watch every element of the ongoing cost structure and also not back off on bringing the new products in because that will really help us. CFO Lewis Booth says Ford still plans to be profitable this year in Europe. We're in a good position in Europe, especially with our latest development in Russia with Sollers because now we have tripled our production capability in Russia. Many people believe that by the end of next year or so, Russia will be the largest market in Europe. How affected are you by the flooding in Thailand? We have a really good plant in Rayong where we make the new Ranger and the Fiesta. The plants there are not affected by the flooding, but what is affected is our suppliers. We are working with all of our suppliers to figure out exactly which parts are affected. We've stopped production. Our best estimate right now is that we'll be able to reopen in the middle of November. We've lost about 17,000 vehicles so far. Mulaaly sees more long-term partnerships with suppliers. Are you going to lose any production in North America or Europe? We don't know yet. We don't think so. To finish that, we think that we [will] lose in total about 30,000 by the time we start again in mid-November. We have work-arounds for all the rest of the operation throughout Europe and the United States and Asia Pacific, but we still are assessing that. There's a lot we still don't know. So far, so good. Ford's supplier relations have improved sharply. What would be the next areas for improvement in your supplier relations? I think it's going to be accessing global innovation. We're moving toward more and more collaboration, more long-term agreements, more technology sharing, more co-development of the technology. The suppliers have a tremendous reach worldwide. So it will be both -- not only accessing the ideas but also getting the value of offering all around the world.